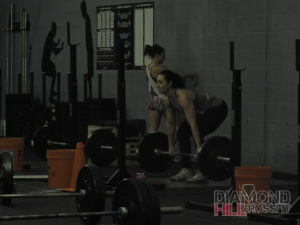 Strength: EMOM 8 – 1 Gymnastic/ Monostructural Goal, EMOM 8 – 1 Weight Lifting Goal. 4 RFT of 30 DU, 15 Deadlifts, 15 Box Jumps. Notes:Choose 2 of your 2018 Goals to work on. 1 WL/1 G.
Push through this WOD, it will help you get ready for the type of WOD in the open. 3 x 10 Good AMs, 3 x 10 Wt Lunges (each leg), 3 x 10 Wt Situps. WOD: 6 RFT of 100m Run, 15 KB DL, 15 Box Jumps.